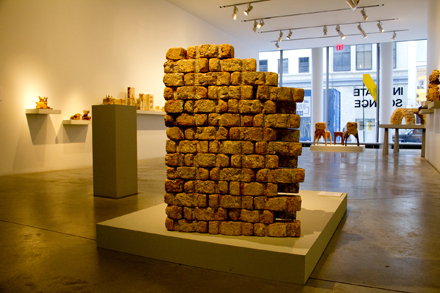 At first glance, many objects on display at the Anna-Maria and Stephen Kellen Gallery at the Sheila C. Johnson Design Center resemble miniature ancient Roman ruins built from artificial materials. But closer inspection reveals that the mud-colored bricks have been grown, not manufactured. By cultivating reishi mushrooms, artist Philip Ross grew a brick wall, table and chairs, and other sculptures. He is one of six artists and artist collectives whose work is on display in Intimate Science, an exhibition organized by the Miller Gallery at Carnegie Mellon University that explores the intersection of art, science and technology, and social change. View the slideshow below to see images from Intimate Science, with comments from curator Andrea Grover and SJDC director and chief curator Radhika Subramaniam.